Frontispiece to A Selection of Scotch, English, Irish and Foreign Airs, by James Aird, published by J. McFadyen, 1782, Internet Archive. Special thanks to follower Adam Hodges-LeClaire for pointing this one out. 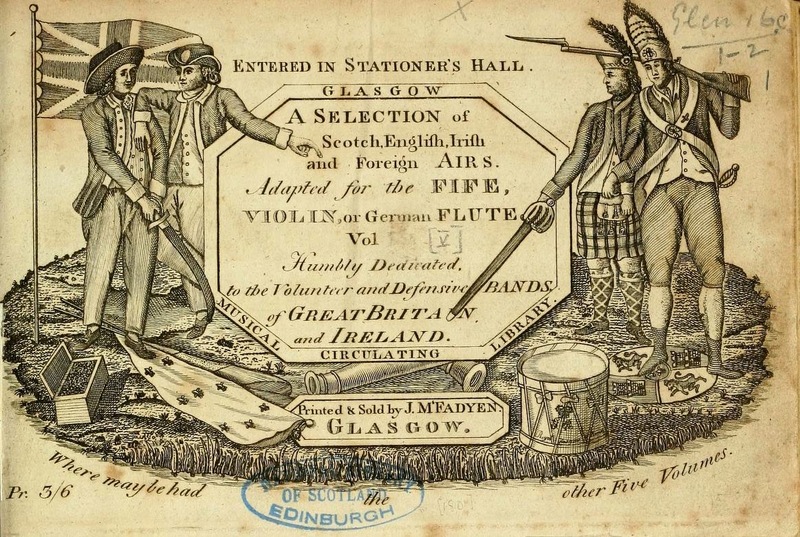 Published late in the American Revolutionary War, Aird's five volume work was dedicated to 'the Vounteer and Defensive Bands of Great Britain and Ireland.' It contained music to inspire the soldiers and sailors in the defense of their homeland, the suppression of the rebellious colonies, and the invasion of foreign territories. The figures in the frontispiece represent a grenadier and highland solider, and two sailors. The grenadier tramps on the seal for Spain, and the soldiers stand on the banner of France. Recognizing the presumed motivations of sailors, an open chest of coins lays beside them. Both sailors wear long trousers that end above the ankle and taper a bit close to the leg. Both wear jackets with drop collars, turned back cuffs, and matching lapels. One wears a double breasted waistcoat, and the other wears a single breasted waistcoat. They both sport bob wigs and round hats, though the fellow on the left has a uniformly upturned brim with tape, and the other's hat is turned up on both the left and right and bears some sort of device on the front. 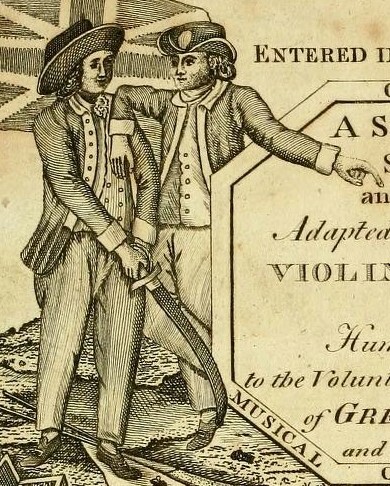 One sailor holds a curved cutlass still in its sheath. Not sure what I'm seeing anyway, but I'd certainly say by this point neither men are wearing bob wigs, but rather simply natural bob styles in their own hair.